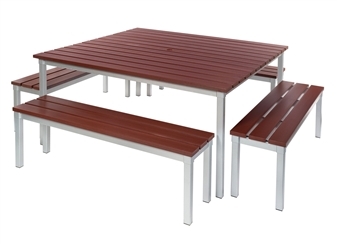 The Enviro Outdoor Benches accompany the Enviro Outdoor Tables (see Related Items below). The benches require no maintainance and can stay outside year after year, with just a wipe of a cloth to keep them looking as good as new. The bench top is a synthetic wood made from recycled materials. It feels and looks like wood but will not deteriorate like wood. 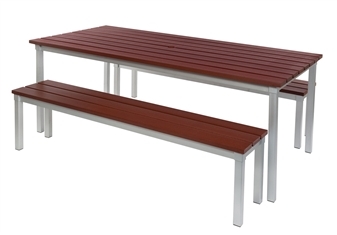 The anodised aluminium frame gives the tables and benches a smart appearance and provides strength and durability for all school environments and public areas such as beer gardens and hotel grounds. 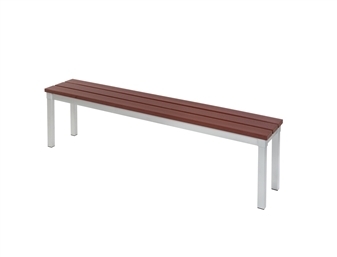 The Enviro Outdoor Benches come in 2 sizes and go with the different sizes of Enviro Outdoor Tables (see Related Items). 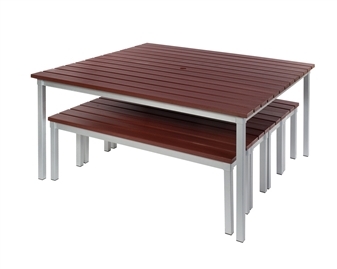 The benches are designed to fit neatly under the corresponding size of table, for easy and tidy storage. The benches are delivered flat-packed and require simple allen key assembly. They come in 3 heights and are 100% recyclable. 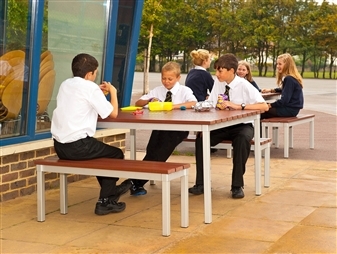 Durable & Robust For School Environments, Hotel & Beer Gardens, Outdoor Public Areas Etc..